A reliable source for Mezzanines Design information and a resource for accessing leading Mezzanines Design and suppliers. Mezzanine design is the process of selecting building materials and building plans in advance of building a mezzanine in a workspace. The mezzanine design process is used to generate plans for office mezzanines, storage mezzanines and a wide variety of other elevated platforms. Mezzanines, outside of the context of theaters, are elevated platforms on which items can be stored, office spaces can be constructed and a variety of other industrial and commercial purposes can be served. Space conservation is of utmost importance in the overwhelming majority of commercial and industrial workplaces. When its space runs out, a company has just a few options. The first option is to expand its structure or build new ones. This process can be very time consuming and expensive; it involves purchasing building permits, submitting to safety and environmental friendliness tests and a variety of other expenses. Another option is relocation, which involves moving all equipment and personnel to entirely different premises. Mezzanines Design Mezzanine design is the process of selecting building materials and building plans in advance of building a mezzanine in a workspace. 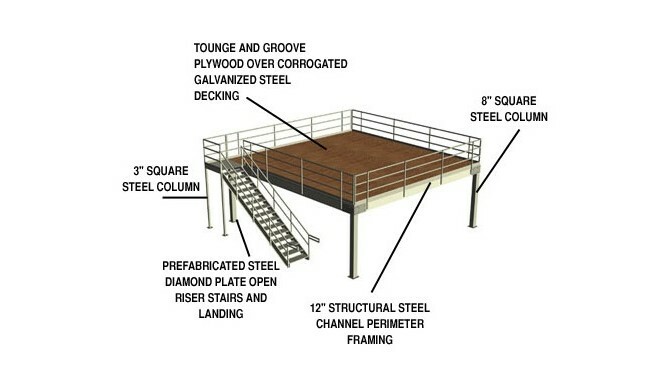 The mezzanine design process is used to generate plans for office mezzanines, storage mezzanines and a wide variety of other elevated platforms. Mezzanines can be used for a variety of invaluable purposes. Office mezzanines are used to create office spaces in industrial or commercial settings. They can be used to create office space above working machinery or storage areas, or they can be used to create office space beneath an elevated working or storage platform. Mezzanine Design - Abtech, Inc. Storage mezzanines are designed specifically to create additional storage space. The creation of additional internal storage space can be invaluable for distributors and other warehouse-based operations. It allows companies to hold a larger stock of inventory at a comparatively low cost. Mezzanines can be constructed out of a wide variety of materials, and they are available in an equally large variety of configurations. They can be pre-assembled in mezzanine prefabrication facilities, or they can be custom-made to fit the needs of individual spaces. Because mezzanines are designed to support the weight of people as well as important equipment and materials, they are always designed to provide maximum safety to their users; mezzanine safety consideration is an integral part of mezzanine design. Because they are such an inexpensive alternative to new space construction, mezzanines are popular, highly valued utilities.